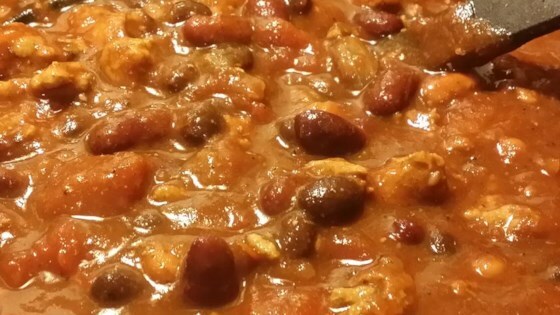 "Good basic chili recipe made easy with the use of canned items." Heat a large pot over medium-high heat. Cook and stir beef, onion, and garlic together in the hot skillet until beef is completely browned, 5 to 7 minutes; drain and discard grease. Stir diced tomatoes, kidney beans, pinto beans, black beans, crushed tomatoes, tomato paste, chili seasoning mix, salt, and black pepper with the beef mixture; bring to a boil, reduce heat to medium-low, place a cover on the pot, and simmer the chili until the beans are tender, about 20 minutes.